This cargo jacket is crafted from a fine Egyptian cotton twill which has been specially treated to accentuate a distressed feel. The coating makes the garment wind resistant, water repellent and easy to care for. 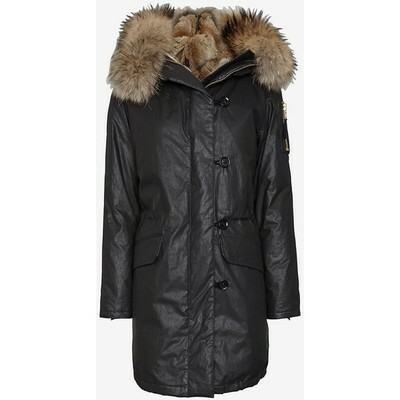 Details include: fur lined hood with zipper, front zipper under snap storm flap, two flap pockets, and zipper sleeve pocket. In black with natural fur. Fabric: 70% cotton/30% polyurethane. Lining: 100% nylon/80% goose down/20% feathers. Trim: 100% natural asiatic raccoon fur; Origin Finland. Model Measurements: Height 5'10; Waist 25"; Bust 32" Length from shoulder to hem: 33" for size small. Made in China.